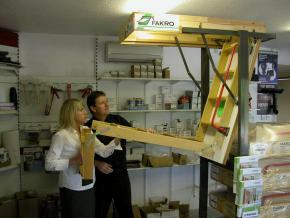 The FAKRO Loft Ladder is a folding pine wood ladder. It provides easy and safe access to your loft. When folded, it is ‘hidden’ in the ceiling, freeing space inside the room. 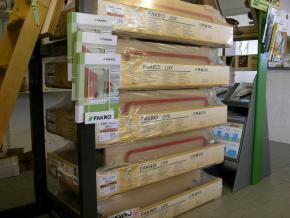 The FAKRO Loft Ladder is a 3- or 4-part folding ladder. Its design and materials used guarantee easy, comfortable, and safe access to the loft. The quick fixing system enables the ladder to be easily installed by two people, and also enables easy ladder height adjustment. The outer side (visible when the door is closed) of the hatch door is smooth- with no fixing points visible. The lock and the metal pole supplied make closing of the hatch door easy. The ladder is fastened with angle brackets that enable the ladder to be positioned and fixed precisely. The unique opening mechanism is designed in such a way that it does not hinder your access to the loft. The adjustable opening door spring mechanism is adjustable to suit personal preference. All ladders’ hatch doors are fully edge sealed with a sealing strip to minimise heat loss. Treads are fitted using dovetail joints for added durability. Ample stock of the standard 600 x 1200 loft ladder ready to go.